Remember last November, when I told you about my first trip to Teshima? I alluded to an event that was too fresh to be told yet. Don’t you think that it’s finally time for me to do it? (no, I didn’t need all this time to finally be ready to tell the story, it has more to do with the fact that it fell a little bit off the radar and that I had to write about other things first). Let’s start with refreshing your memory a little bit. 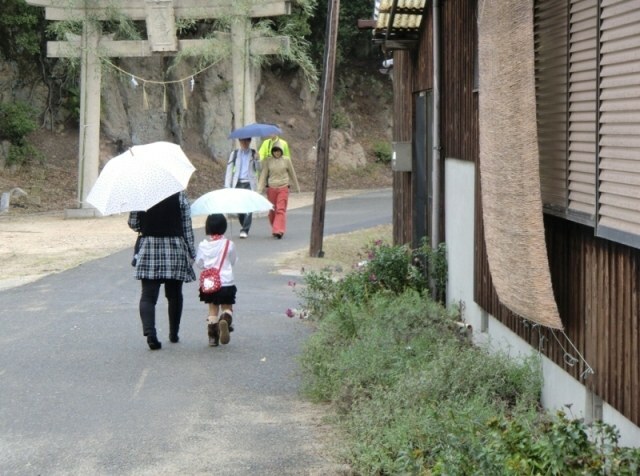 It was October 21, 2010 and we were on Teshima, visiting the Setouchi International Art Festival. We had landed a few minutes earlier in the port of Karato and were walking through the streets of this very charming village towards our first artwork of the day, Swaying with Laver, when a little old woman stopped to inform us that there was a Matsuri that day in the village and that we were welcome to join her and everybody else at the shrine if we wished. 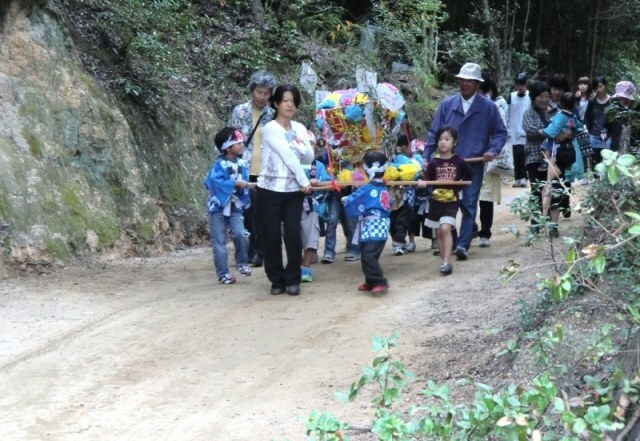 I was really surprised that an old Japanese lady didn’t hesitate, in such a friendly way to, not only to talk to foreigners, but also invite them to a very local celebration. 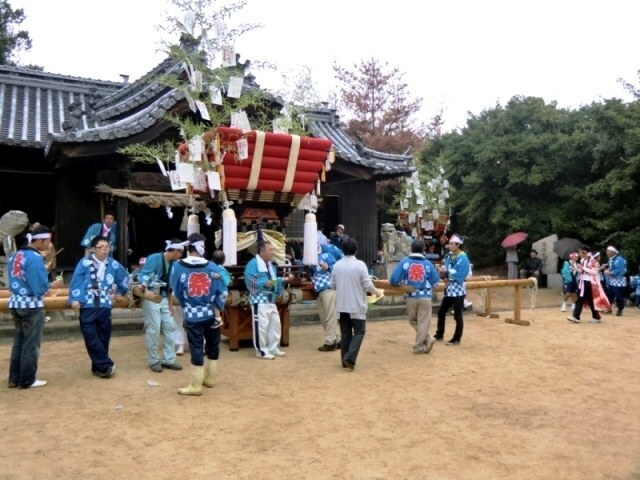 Although, if you’re a regular reader of this blog, you already know that the people of Kagawa are far from the shy and aloof stereotype that is given to Japanese people when dealing with foreigners, but apparently the people from Teshima fit the stereotype even less. 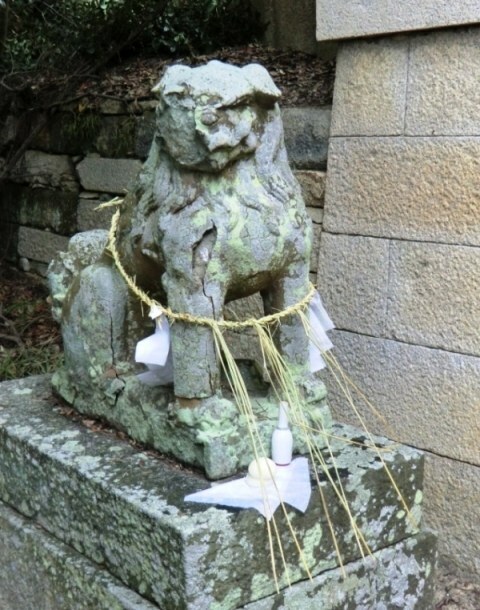 So, after spending long (but too short) minutes “swaying with laver” we walked towards the village’s shrine. Luckily, it was on the path to our next artwork stop, Les Archives du Cœur. 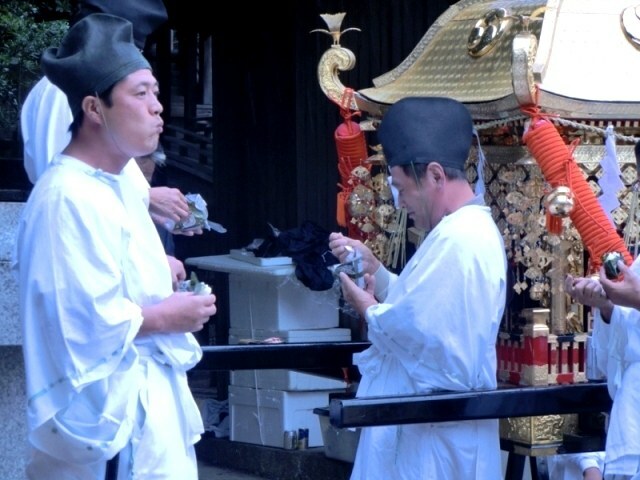 The shrine was dedicated to Hachiman, and indeed, there was a Matsuri that was ready to start. 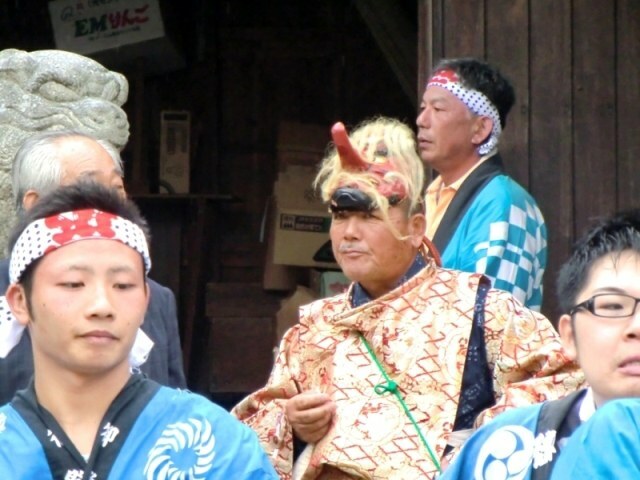 It was the smallest Matsuri I had ever seen. 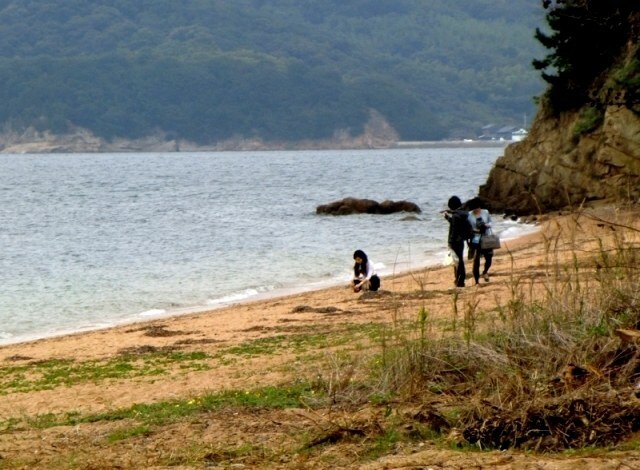 There must not have been more than 200 people (out of the 1,000 that constitutes Teshima’s population). Festivities and celebrations hadn’t actually started and everybody, people taking part in the Matsuri as well as the audience was busy eating and drinking. Actually, it was not 11am yet and one could tell that a lot of beer had already been consumed. We were barely there that Onigiri and drinks were put in our hands before we had time to realize what was happening. Often, when there is such a type of event or gathering in Japan, as the only -or at least one of the very few- Gaijin present, I can notice two types of behavior with me. Either people look at me as if I was the strangest thing they have ever seen (mostly kids in general, but adults too at times) or, on the other hand, people simply ignore me. Not actually ignore me, but make a special effort to make sure I think they ignore me (for instance, being very careful that I don’t see them looking at me and those sorts of things). There, to my great surprise, everybody behaved as if it was the most normal thing for me to be present at the event. Everybody was adorable, not only we were fed more than we needed, but it was done with big sincere and natural smiles. Some people went as far as chatting with me. Of course, I couldn’t understand a word, but it didn’t matter, it just led to more genuine smiles. The one thing I did understand clearly though, is that people were greatly surprised that I didn’t drink more than one beer although it was free and handed to me every two or three minutes. I’m telling you, I regret today. Who refuses free beer? Thing is, it was still pretty early to get drunk, a bit too early for my taste (not for theirs apparently) and I needed to keep a clear mind for the visits we still needed to do. We stayed for a few more minutes, but as the Matsuri was barely starting, we decided to go to our next visit, and return to the shrine later. In other words, we’d go see Christian Boltanski’s project and then come back. 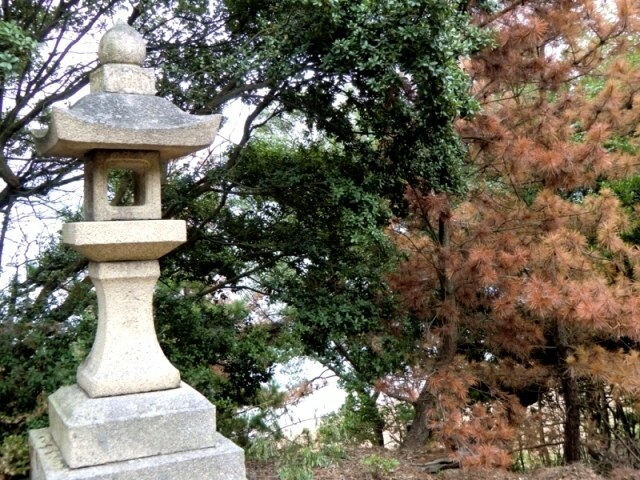 The shrine is quite old, and there isn’t much money to renovate it. Unless the Festival brought enough? This beach was gorgeous. I hope I get to return during Summer in the not too distant future. 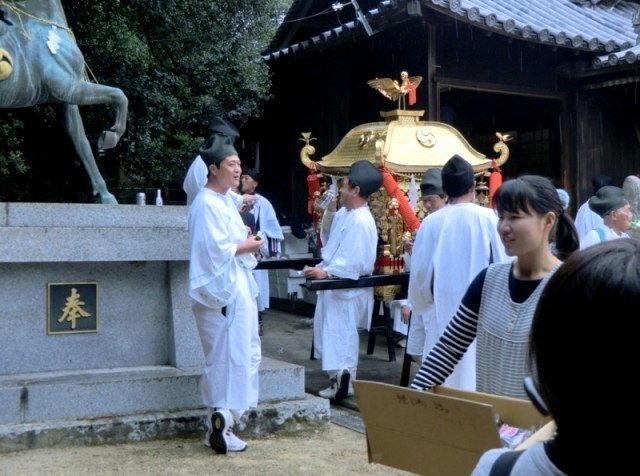 Shortly after, we returned at the shrine’s foot (as it was on top of a tiny hill). According to the noise coming from it, things were starting to be set in motion. 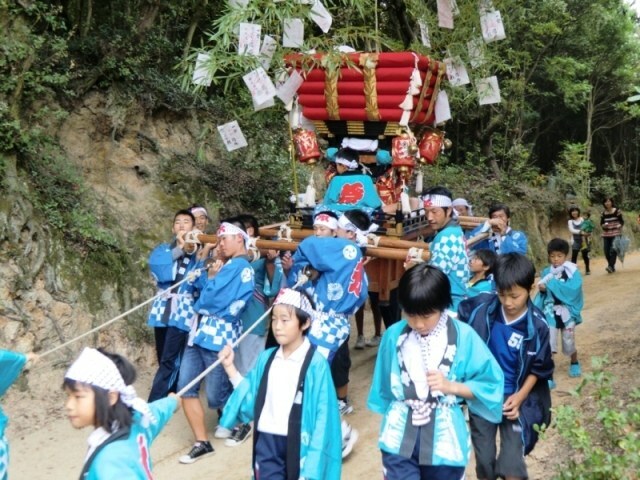 Indeed, a few seconds later, we saw a mini Taikodai coming towards us, carried by children. A few minutes later, it’s another one, slightly bigger and carried by teenagers this time that passed by us. What a valuable post! Thank you for sharing.I think that local Japanese are more friendly than urban Japanese. I am howling at the video! So glad that you mentioned all the beer. That explains a lot. The beer is definitely necessary to find the strength to carry those things.